HB431 RELATING TO MOTOR VEHICLES. HB1136 RELATING TO THE COUNTIES. HB1137 RELATING TO THE DEPARTMENT OF TAXATION. HB1138 RELATING TO THE DEPARTMENT OF BUDGET AND FINANCE. HB1139 RELATING TO THE DEPARTMENT OF ACCOUNTING AND GENERAL SERVICES. HB1423 RELATING TO CAPITAL IMPROVEMENT PROJECTS FOR THE BENEFIT OF THE THIRTY-NINTH DISTRICT OF THE HOUSE OF REPRESENTATIVES. HB1431 HD1 RELATING TO THE BUDGET OF THE OFFICE OF THE LIEUTENANT GOVERNOR. HB1582 HD1 SD2 RELATING TO CONCESSIONS ON PUBLIC PROPERTY. HCR102 HD1 REQUESTING THAT THE DEPARTMENT OF TRANSPORTATION AND THE CITY AND COUNTY OF HONOLULU DEPARTMENT OF TRANSPORTATION SERVICES ADDRESS THE PROBLEM OF ABANDONED SHOPPING CARTS ON OAHU. HR95 HD1 REQUESTING THAT THE DEPARTMENT OF TRANSPORTATION AND THE CITY AND COUNTY OF HONOLULU DEPARTMENT OF TRANSPORTATION SERVICES ADDRESS THE PROBLEM OF ABANDONED SHOPPING CARTS ON OAHU. HR96 REQUESTING THE DEPARTMENT OF PARKS AND RECREATION OF THE CITY AND COUNTY OF HONOLULU TO BUILD A DOG PARK IN THE KAPOLEI AND MAKAKILO AREA. Representative Ty J. K. Cullen, is no stranger to public service. 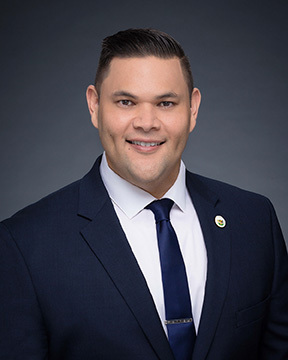 He has served his central Oahu community as a member of the Waipahu Neighborhood Board and the Village Park Community Association. Ty represents the residents of House District 39, Village Park, Royal Kunia, Waipahu, Makakilo, West Loch, Ewa and Honouliuli. Representative Cullen holds a BA degree in Sociology, a BA degree in Political Science, and a Masters degree in Public Administration. Honowai Elementary's Lowell Kalani Spencer was named HIDOE's 2016 Employee of the Year for his meticulous work as head custodian. TRAFFIC RELIEF IMPROVEMENTS MADE IN TIME TO HELP "BEAT THE SCHOOL JAM"
HONOLULU - As part of the annual "Beat the School Jam" campaign, the Hawaii Department of Transportation (HDOT) detailed the implementation of several projects that will help alleviate traffic. It continues the HDOT focus on safety and system preservation projects that use far less money and time to finish. As part of Governor David Ige's initiative to reduce traffic, HDOT is implementing several improvements designed to keep motorists moving. Below is a list of projects that have been implemented prior to the start of the Beat the School Jam. Second Zipper lane added The Zipper lane now accommodates two lanes of traffic from the H1/H2 merge to the Pearl Harbor area. The improvement expects to add 20 percent more volume within the Zipper lane which will help carpool vehicles move more efficiently, while also reducing the amount of vehicles in the single occupancy lanes. The Zipper lane hours have been extended 30 minutes and is now available from 5:30 - 9 a.m. weekdays, excluding holidays. Beat the School Jam As it has in the past HDOT will suspend construction-related road closures during daylight hours on major highways from Aug. 22 through Aug. 26 to alleviate traffic congestion during the week when more than 53,000 university, college, and private school students begin their fall semesters. Simply register at www.GoAkamai.org for this free service. The registration process for MyGoAkamai allows users to select from a number of predefined trips, identify the types of events that are of particular interest, decide when alerts should be sent, and whether they are to be received by email or text. GoAkamai is able to support users, whether they're accessing it on their desktop, laptop, smartphone, or tablet. Representative Cullen was featured in two NCSL articles on Military Affairs issues.